Watt about the upwelling longwave over oceans? I know I was going to have a bit of a break but this is just a short post to try and explain something to Willis Eschenbach. He has a new post on Watts Up With That (WUWT) called Upwelling Longwaver Over the Ocean. Willis has recently been playing around with CERES data and here he shows a set of curious graphs …. [showing the] outgoing (upwelling) longwave radiation at the top of the atmosphere (TOA) versus the sea surface temperature. The graph for the Southern Hemisphere is below and is just a plot of outgoing flux (Wm-2) on the y-axis and sea surface temperature (oC) in the x-axis. I’m surprised at how little the TOA upwelling longwave changes from season to season. The sun comes and goes … but the southern hemisphere upwelling LW is largely unaffected. Every season of the year it’s about the same, 200 W/m2 around the icy antarctic, rising to 300 W/m2 at about 28°C, and then dropping from there. What’s up with that? Well, I think that’s because Willis has plotted outgoing flux against temperature. Just because it’s summer, winter, autumn or spring, if a particular region of the sea has a particular surface temperature, I suspect that this largely determines the outgoing flux. 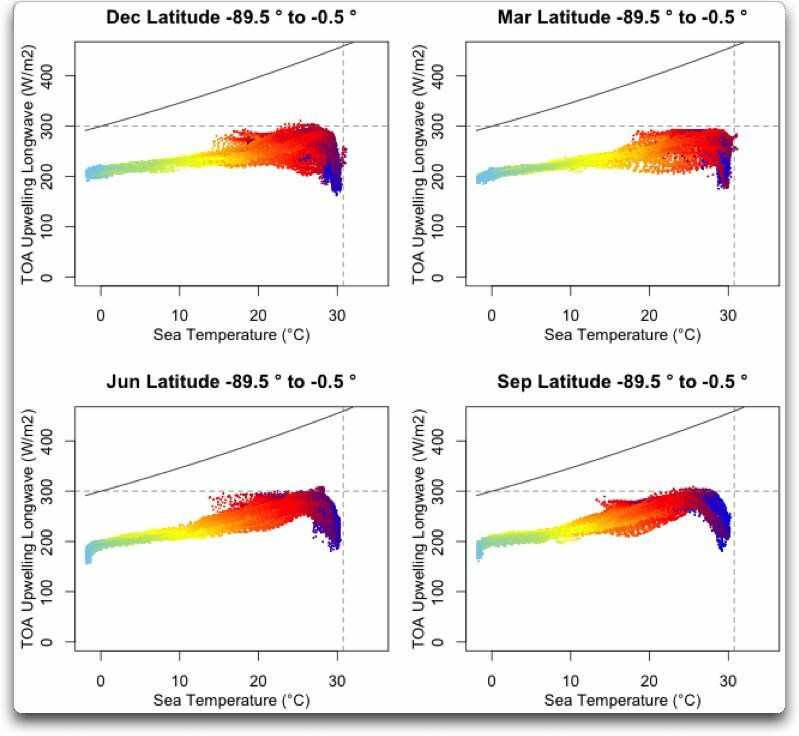 The sea surface temperature may vary with season, but the outgoing flux (as a function of temperature) does not change. But Willis could actually do quite a lot more if he really wanted to. He could go to the MODTRAN radiation transfer code. If you set the CO2 ppm to 390 (i.e., roughly today’s value) and the Ground T Offset to -27 (i.e., OoC) you get an upward IR heat flux of 200.05 Wm-2. If you change the Ground T Offset to 3 (i.e., 30oC) and redo the calculation you get 299 Wm-2. That seems remarkably similar to the values in Willis’ graph (i.e., about 200 Wm-2 when surface temperatures are 0oC and about 300 Wm-2 when surface temperatures are 30oC). You can change the the type of atmosphere (I was using the Tropical Atmosphere) but then you’ll need to adjust the Ground T Offset to set the surface temperature to be what you want it to be. So, as far as I can tell there is nothing particularly surprising about these figures. What Willis appears to have essentially shown is that radiation transfer codes – used to determine how CO2 and other greenhouses gases influence the outgoing longwavelength flux – are largely consistent with observations. This entry was posted in Anthony Watts, Climate change, Global warming, Watts Up With That, Wilis Eschenbach and tagged MODTRAN, Outgoing longwave radiation, Sea surface temperature, Watts Up With That, Willis Eschenbach. Bookmark the permalink. 14 Responses to Watt about the upwelling longwave over oceans? I think that Willis is puzzled about why the colors don’t change so much (the change is more pronounced in the NH). I notice that Willis is getting a hard time from Roy Spencer about his attempts at citizen science. Roy seems to be arguing that Willis should at least consider that others will have actually tried these various analyses and should stop suggesting that actual scientists are stupid for not noticing these obvious things. If I understand what Roy is saying, I tend to agree. Its pretty funny. The septics never learn anything from anyone, and so never get anywhere; but Willis is really really unhappy to be called out for it by someone he isn’t allowed to hate. Indeed, I’ve just been reading the paper reference by Roy Spencer (http://www.drroyspencer.com/wp-content/uploads/Stephens-review-of-cloud-feedback.pdf). Seems to basically do what Willis thinks he’s done. It even seems to explain the turnover at just below 30oC, but I haven’t quite worked out what the explanation actually is. I found it funny, sad and annoying at the same time. I feel a little sorry for Willis, but he’s amongst those non-scientists who get air time on a blog that provides information to people who have influence (Andrew Neil, Matt Ridley, …). You’d think it would be patently obvious that you can’t get your info from a blog (mine included), especially one where the articles are written by people who have no formal training at all and who are claiming to have discovered something obivous that thousands of professionals have somehow missed. I start to understand why the climate ostriches can have such enormous differences of opinion, but hardly ever debate each other. Maybe they don’t dare, because they know that when a debate starts, its rapidly escalates. Popcorn! Our rabbit would write. Wotts, the turnover at low latitudes is due to the much thicker atmosphere, higher humidity to a greater altitude, and more frequent presence of cumulo-nimbus clouds over the zone spanned by the Hadley Cells. That is driven by the strong convection in the tropics, and results in a much stronger greenhouse effect over the tropics than elsewhere. Actually, the colours do change significantly. Taking 70 degrees plus (sky blue), it has a hard cut of just below freezing as the ocean surface turns to ice, but its lateral extent in December is nearly double that in June. That is, you get much warmer temperatures in December at that latitude, though being bound in the south by Antarctica, you still get temperatures near freezing. Another example of significant change is the greater depth of the “turnover” as the ITCZ moves south in the summer. Roughly, it makes a 15 W/m^2 difference in the lower bound of OLR with high SST. That is a significant difference, but given the large scale, it is difficult to pick by eye. The apparent constancy of the graph is a function of the large scale, and the overlay of colours which makes it difficult to peak out change in seasonal distributions of temperature for each latitude band. Thanks, Tom. That’s what I was starting to get from reading the Stephens paper. I assumed there was a reason that was already quite well understood. Yes, that’s true I guess. As you say, plotting everything together does make it quite tricky to see the seasonal variations. The trouble is if you dole it out, you have to expect to receive it. Unfortunately, most of the time people on WUWT say what they like without any auditing (to use a popular term 😉 ).